In 1928, MIT became the first institution in the nation to establish a meteorology curriculum, and has been a leader in climate science ever since. Continuing to advance our understanding of climate systems is one of the great intellectual challenges—and responsibilities—of our time. With cyclones growing in frequency and ferocity, communities increasingly being threatened by landslides and extreme flood events, and melting permafrost endangering habitats and belching large amounts of trapped carbon dioxide and methane into the atmosphere, the need for fundamental research is becoming more and more critical. 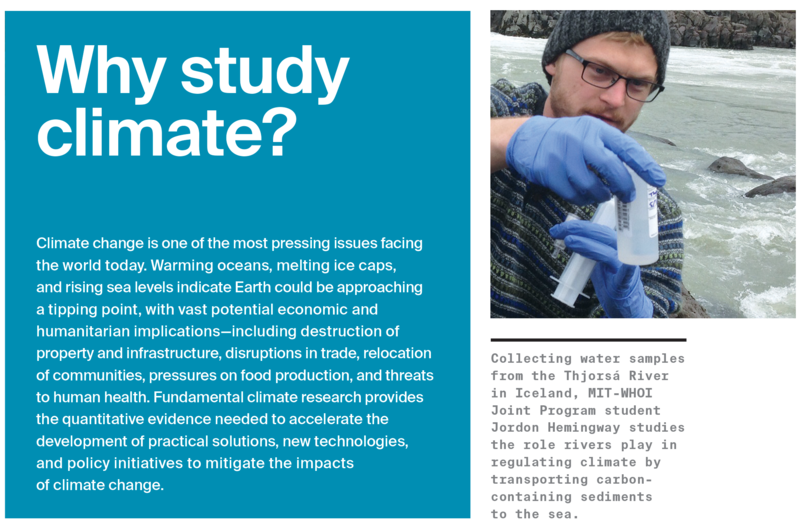 Collaborating with researchers across multiple disciplines, we are determined to understand how climate works and how our scientific knowledge can guide us toward long-term sustainability. To help plan for the future, we seek to answer profound questions. What caused Earth’s past climate shifts, and what is our climate’s natural variability? How do climates evolve on other planets? What role do the oceans play in regulating Earth’s temperature? What about their role in the carbon cycle? Can microbes influence the atmosphere? How does ocean acidification affect the biosphere? Does airborne particulate matter affect cloud formation? What are the links between anthropogenic activities, air and ocean pollution, and climate change? Does rapid climate change contribute to mass extinctions? 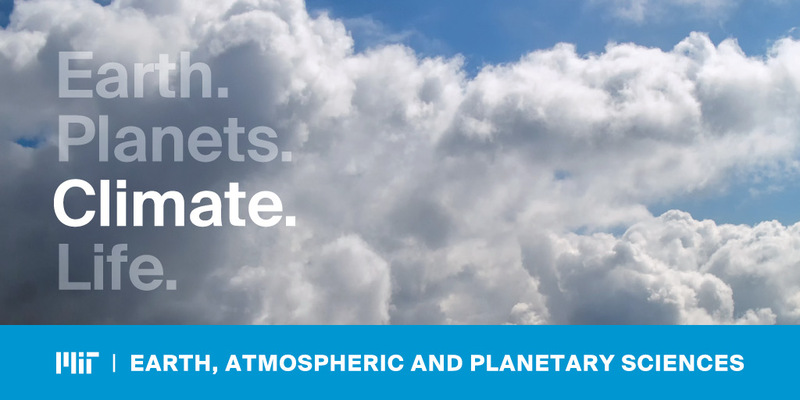 In EAPS, atmospheric scientists, oceanographers, geologists, and planetary scientists work together to understand the elaborate, interconnected natural systems which combine to produce and influence our climate. Precise uranium dating of stalagmites found in a Nevada desert cave provides a timeline for a once much wetter American West. In the mountains of Rwanda, the first long-term atmospheric observing station on the African continent will fill in vital missing data about global greenhouse gas emissions. The MIT Global Circulation Model—a sophisticated virtual tool now used by hundreds of researchers around the world—simulates the interplay between the oceans, atmosphere, and climate in 3-D, with the capacity to examine ocean dynamics at the planetary scale, all the way down to fine resolutions of just one square kilometer. 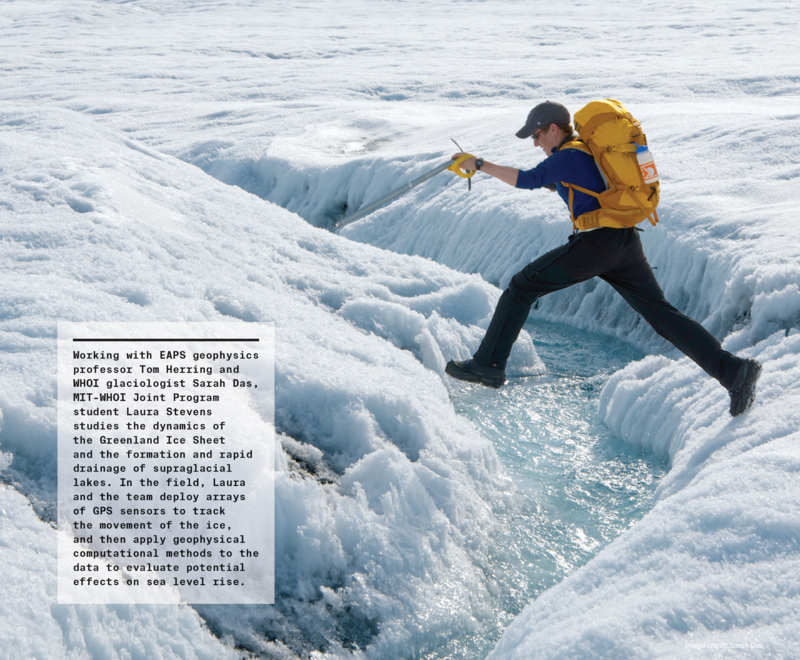 Seismic sensor networks allow us to continuously monitor seasonal fluctuations in the Greenland ice sheet. And by making a few adjustments to a cloud chamber designed to study atmospheric conditions on Earth, we are able to create a Martian analog which allows us to study how clouds may form on the red planet, giving us insight into the mechanics of our own climate.